Hi-Point specializes in the fabricating a wide range of dental services. We are accustomed to working within strict time frames, and we understand there may be a level of urgency required by your patient. Cementation is the most commonly used restoration in dental implantology. Advantages include the compensation of improperly inclined implants, easier achievement of passive fit due to the cement layer between the abutment and reconstruction, lack of a screw access hole, and thus the presence of an intact occlusal table and easier control of occlusion. Screw-retained restorations have the advantage of more predictable retrievability. They require a minimal amount of interocclusal space and are easier to remove when hygiene maintenance, repairs or surgical interventions are required. 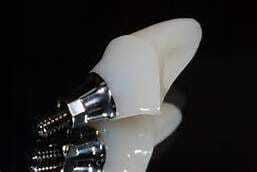 The implants will create a stable prosthetic replacement for teeth. The implant-supported prosthesis is a “hybrid denture,” referred to as a hybrid because it combines the advantages of a fixed replacement with those of a removable denture. It is a cross between a traditional denture and a fixed bridge. Custom Titanium abutments provide a precise fit and are milled using CAD / CAM technology. This precision allows us to get a natural looking emergence profile and helps us contour the the gingiva for the perfect crown esthetics. These abutments are well known for their strength, and are used in all tooth areas. 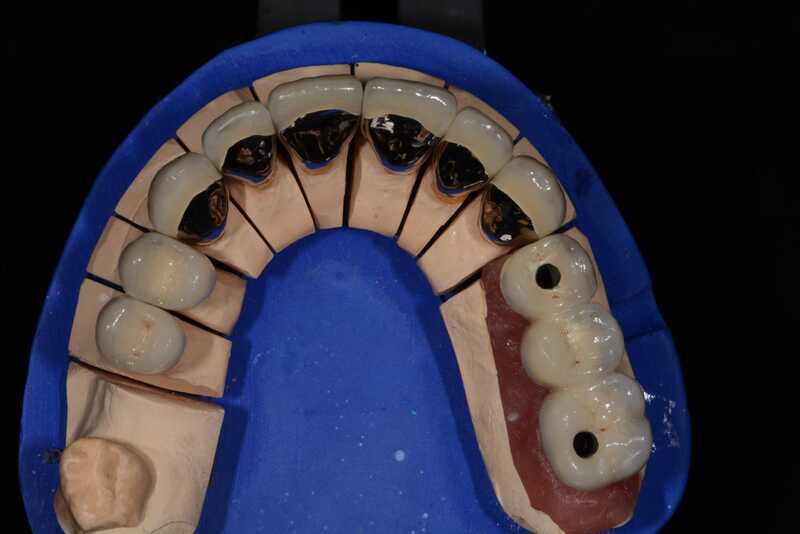 These abutments can also be anodized ( gold color) to avoid dark or cold grey colors to show through. 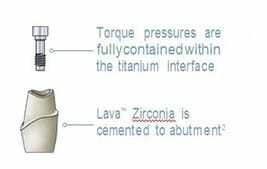 Hybrid Zirconia abutments have the strength of titanium base, combined with the advantages of an esthetic zirconia substructure. Several implant systems have different ways these materials will bond together. Some have a mechanical bond, while others have a chemical bond. Whichever you choose, the restorative capabilities of theses abutments are like no other due to the strength and esthetics. Cast custom abutments are made by using UCLA abutment (plastic cast-able sleeve to machined platform interface) by the laboratory technician. Starting with wax we shape the abutment to get the perfect contour and emergence profile needed. We Sprue, and invest the pattern and place it in our burnout furnace. We cast the abutment out of the prescribed alloy. After devesting the cast abutment is finished and polished. Screw-retained emax® crowns are the ideal solution to illiminate the risk associated with peri-implantitis. 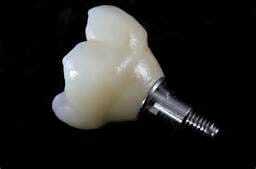 Because of the absence of cement under the gingival tissue since the crown is cemented at the laboratory. 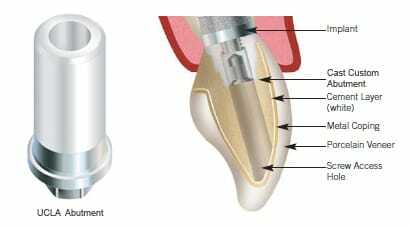 In addition, the screw retained crown affords the clinician a streamlined retrievability for cleaning or adjustments. Screw-retained crowns can be constructed from your choice of materials, including Full Contour Zirconia, IPS e.max®, or base PFM *High Noble available for additional cost. This restoration is an aesthetic hybrid (a full zirconia bridge on a Titanium base) with implants. This restoration is screw retained. There are two main variations of the hybrid zirconia restoration: a monolithic approach, where it’s made out of a block of zirconia and stained by an expert for aesthetics, and a second approach for a higher aesthetic outcome, where IPS e.max® crowns are individually created and cemented to the zirconia bar. For both restorations, the technicians start with the implant, design the zirconia frame, stack the zirconia, and then build the pink porcelain on it. This restoration is an hybrid (a full contour zirconia bridge on a Titanium base with facial cutbacks and added esthetic porcelain) with implants. This restoration is screw retained. This method requires a little more time and use of materials. A wax set up is made from denture teeth and tried in for size shape and color. Our technicians then scan and design a prototype of this denture. Cut-backs are made on the facial portion of the restoration usually only on the anterior. Porcelain is added to give a life-like look for added esthetics. Porcelain Fused to Chrome-Cobalt Alloy crown and bridge has been used in dentistry for many years. 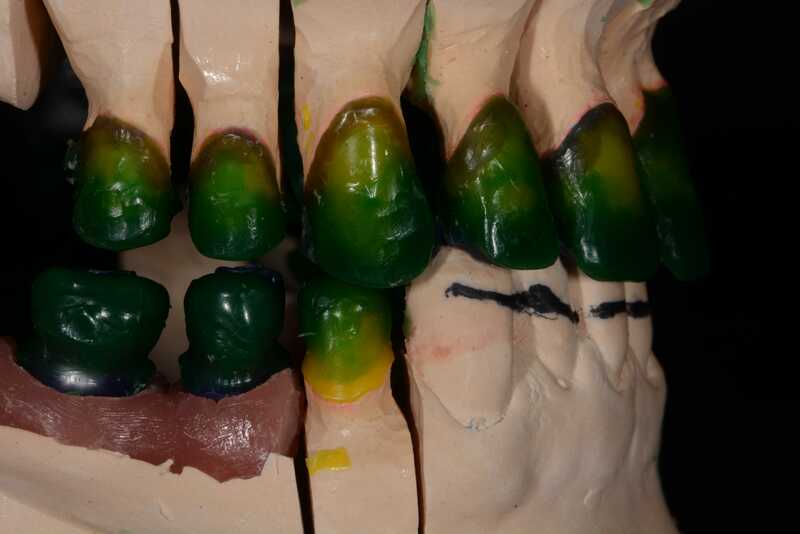 This restoration can be screw retained and or cement retained. Our accurate production process ensures great aesthetic and optimum functional occlusal surfaces on all our PFM cases. All alloys used are: FDA approved. Our porcelain fused to Co-Cr Crown has strong compression and tensile strength, and the porcelain gives the crown a white tooth-like appearance, suitable for front teeth restorations. It has excellent margin, sealing and stable performance, high intensity. 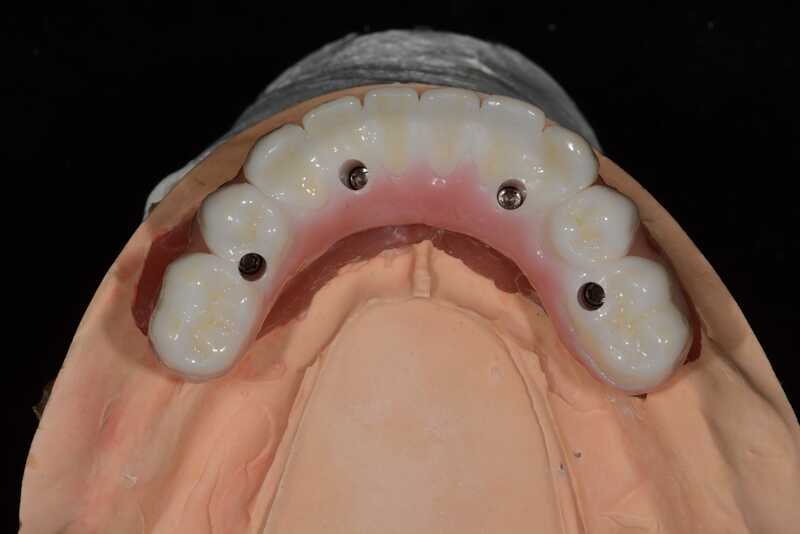 A full zirconia bar with individual crowns is a screw retained implant supported prosthesis. This restoration is Monolithic, (milled from one piece of solid zirconia). The posterior teeth are stained and glazed, where the anterior teeth have preparations, and IPS e.max crowns are cemented to the zirconia bar. 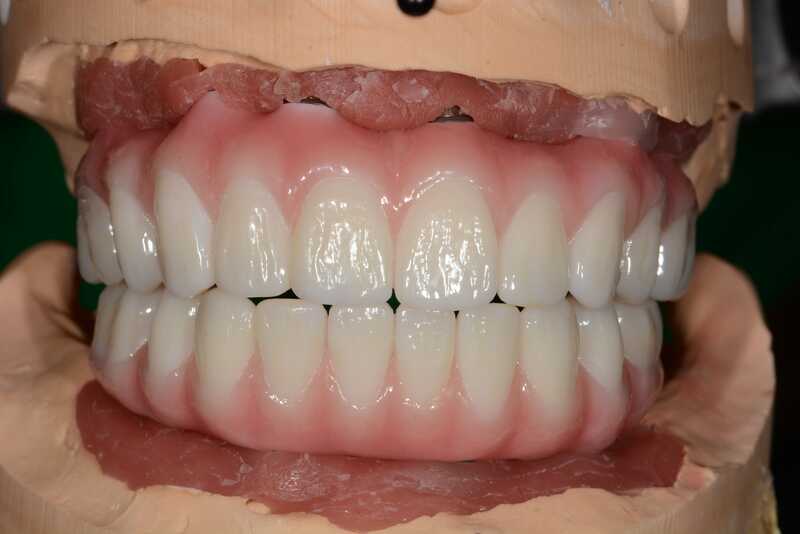 Pink porcelain is then added to complete and give life to this hi aesthetic full arch restoration. A screw retained titanium bar (milled) with prepared teeth. The titanium bar will be milled after a try-in has been confirmed by the dentist, using a wax set up and also a prototype made from PMMA. 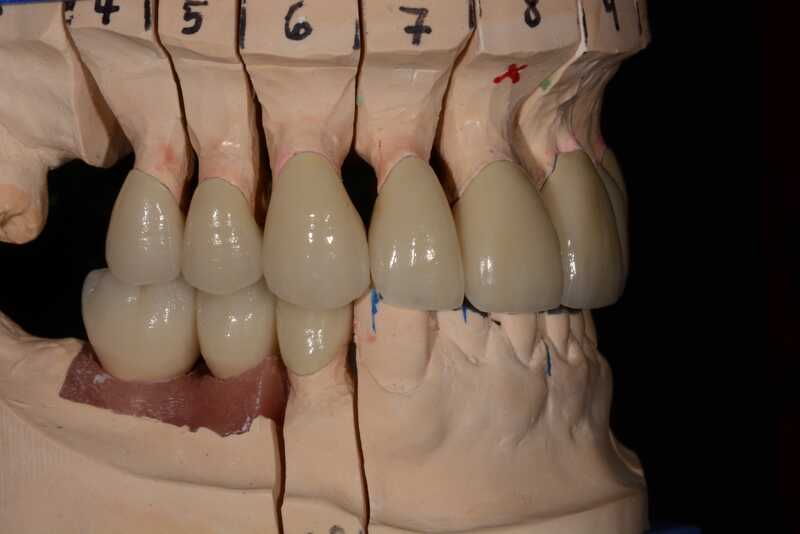 The bar is then opaqued for individual ceramic or PFM crowns to be cemented to these preps. 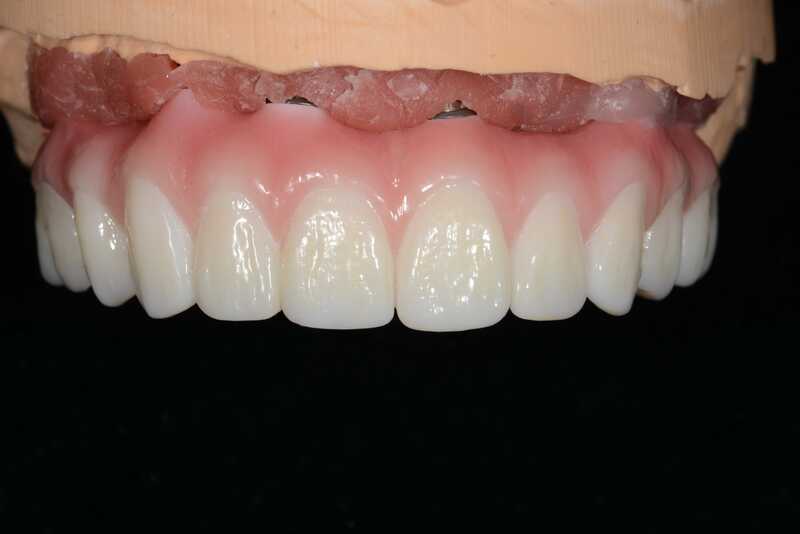 To finalize, pink composite is then bonded to the titanium frame to match the patient’s natural tissue color. Screw-Retained Hybrid Denture utilize a screw retained fixed design function. This restoration combines a CAD/CAM precision milled titanium bar incorporated in acrylic with premium teeth. A Screw-Retained Hybrid Denture is an implant supported system. 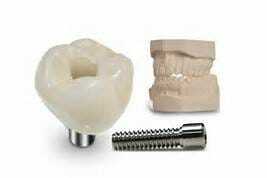 This commonly uses to permanently retain dentures utilizing implants as a type of anchor for retention and stability. 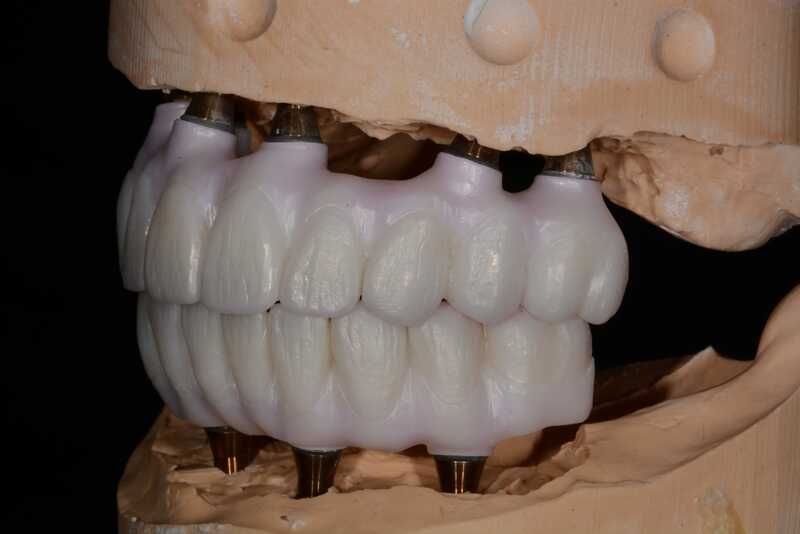 Screw-Retained Hybrid Denture are extremely durable and precise fitting. IPS e.max ® is made of monolithic lithium disilicate ceramic and delivers outstanding esthetics and precision fit. Full Contour Zirconia is a monolithic zirconia crown, bridge, screw-retained implant crown, inlay or onlay with no porcelain overlay. With layered zirconia there is no metal to show through and no unsightly black lines at the gingival margins. PFM (Porcelain Fused to Metal) prosthetics are still the most widely prescribed replacement for natural dentition. Hi-Point Dental Lab Located in Rolling Meadows, Illinois at 5104 Tollview drive. Conveniently located minutes off of HWY 290 and the Intersection of 53 and Algonquin Rd. Our facility, over 6,000 square feet houses our custom shade room. Custom Shades are preferred to be taken by appointment. Please contact our team by calling us at 847-577-5200 to schedule your patient’s custom shade. The dental office or the patient can make the custom shade appointment. To achieve the best shade possible, we recommend that the patient wait at least two weeks after completing the teeth whitening or bleaching process, to record an accurate shade. Because each patient is unique, sometimes the subtleties of matching crowns with natural teeth is best accomplished by meeting face to face with your dental ceramist. We offer a clean, modern and professional environment for custom shades. When sending a patient to our lab for a custom shade, you can feel confident that we will consistently provide the best service and quality for your patients and their dental restorations. Beyond just color, the patient’s intrinsic translucency, hue, value, chroma and texture are all assessed through the use of computerized tools, neutral lighting, color mapping, digital photography, 3D models, and advanced shade guide systems. The porcelain for your restoration is then custom blended, to perfectly match your patients neighboring, adjacent, and opposing dentition. In addition to providing our doctors with the best restoration possible, we also work in office chairside with the doctors and staff to help provide immediate temporization of dentures to a fixed platform of dental implants. This service also consists of case planning, material selection, and implant prosthetic parts handling. This eliminates the difficult task of logistics, by having all the necessary pieces in place, at the right time, without ordering unnecessary expensive parts. Let our team of professionals with years of experience help make your large surgical cases a complete success from start to finish. Eliminate the hassle and stress now. Call or email us today to find out how! Again our staff is in your office if needed to help take verified impressions to ensure a perfect fit for the final restoration. We assist in the impression taking process, pouring models, articulation and cross mounting. A wax denture set up is completed, and ready for try in. This is a necessary step to make sure the patient likes the size, shape, color and the set up of the teeth. Any adjustments to color, shape, size, midline, and set up have been made for a perfect fit and occlusion to meet the needs of the patient and the specifications from the doctor. The wax set up is again tried in for fit with the titanium bar in place and x-rays are taken to make sure the fit is completely correct. The case has been processed, finely polished and finished. Sent to your office for seating. Most offices do not require our team to be present at this appointment. If your team should need us, special arrangements can be made to accommodate you.